The weather today inspired me to make a fresh lunch for tomorrow; and my health--or lack thereof--inspired me to put together a healthy salad. Oh and I had vegetables about to go bad lying in my refrigerator. 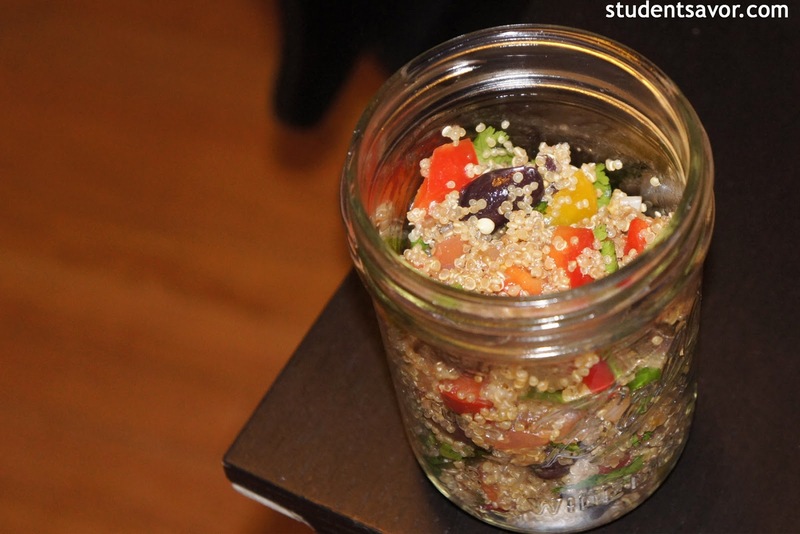 So I adapted a quinoa salad that I found on GoJee--a site that you need to bookmark if it isn't on your favorites already--and its all nicely packed up for me to take it to the office in the morning at sunrise. Before I get to the recipe, I want to write about these past few days. I was bedridden yesterday due to a vicious cold. I had the perfect excuse to catch up on most of the TV series I watch and read up on Medieval Christianity (for academic purposes) without leaving the comfort of my cozy apartment; but to be honest--and for those of you who don't know me this might be surprising--I was less than excited about laying in bed all day. I'm an active person and when I know there is something I can be doing--be it work, exercise, cooking--I get annoyed. Thankfully today I felt somewhat better and I was able to go about my life almost normally--I still slept in until past 9 a.m., which is also something that annoys me. Ideally my cold would dissapear by tomorrow, but realistically I know I'l have traces of it until the weekend. So in hopes of making it shorter, I shall strive to eat extremely healthy foods these next few days. Cue the quinoa. Active time: 10 minutes. Total time: 40 minutes. In a medium pot, bring vegetable broth to a boil. Add quinoa, reduce heat to low and cook, covered, for about 15 minutes, or until quinoa sprouts. Remove from heat and fluff with a fork; let sit for 5 minutes. Cool at room temperature for about 10 minutes and transfer to refrigerator to cool completely, about 15 more minutes. In a small sauce pan, melt the Smart Balance over medium heat. Add onion and sauté until tender, about 4 minutes. Remove from heat and cool. In a small bowl, combine olive oil and vinegar and season with salt and pepper. Set aside. 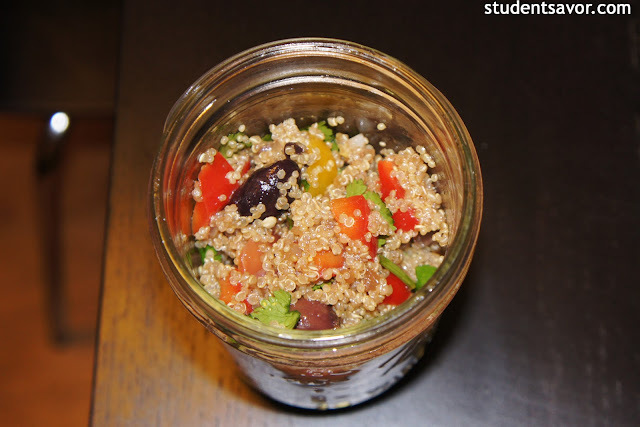 Transfer quinoa to a large bowl. Add bell pepper, tomatoes, cilantro, olives and cooled onion and stir. Whisk in the dressing until mixed in.